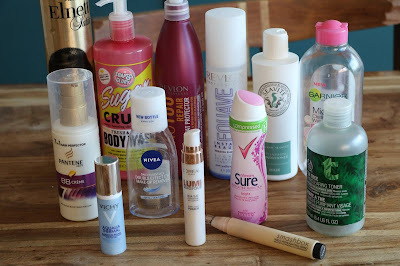 Not as many empties this month but I have gone trough few things and since I used them all up I can say the full on opinion what I thought and would I repurchase them. 1.L'Oeal Elnette hairspray. I am not too picky about hairspray so I always go for L'oreal, and most of the time I get them when they are on sale 3 for 2 or other offer. 2. Soap & Glory Sugar Crush Body Wash- I really liked the scent and made my skin soft but I wouldn't repurchase it because the pump wasn't the best, slightly after half way I had to unscrew the cap every time I used it. 3.Revlon Pro You, repair heat protect shampoo- I loved it was a great shampoo made my hair soft after I washed it without using conditioner and that says a lot because most of shampoos make my hair dry and I have to use conditioner to get rid of that straw like feelig. 4.Revlon Equave blonde Detangling conditioner- Since it is purple it does help you to keep away the brassy and yellow tones from your hair. and it makes hair really soft and smells great.I use it religiously after I was my hair every time. Would I repurchase it? YES, Already did 2 more bottles. 5. Seavite organic seaweed, replenishing conditioner. It was a really nice conditioner, I am not sure where to get it or how much it costs tho cuz I did not purchase it myself. 6. Garnier Micellar water. I only buy this if it is on sale I dont think it is as great and amazing of a makeup remover as everyone claims it to be, it is oky but I would not spend the full price on it , so time to time when i see that it is on sale I only get it then. It is good tho for days when you are at home and not wearing makeup to take of the execs oil and dirt of your face. 7. Pantene BB cream for hair- I got this when it was on sale in Dunes stores and it was oky product if you don't use too much of it otherwise it will make your hair feeling like it has been coated with a lot of disgusting stuff and your hair will most definitely not be soft. I wasnt anything special or game changer for my hair. Lasted a really long time tho. 8. Nivea Daily Essentials Double Effect Eye Makeup Remover- Ive been using this for some time now or the Ganier double effect eye makeup remover because they take of waterproof makeup easy due to the fact there is an oil in it. I have never used and never will use wipes to remove my makeup because it is damaging to the skin as you are dragging it and applying heavy pressure to your skin especially on the eye area where you have to be more gentle. Would I repurchase it? YES I always buy these when I see that they are on offer because know ll use them anyways. 9. Sure Deodarant- This pink bottle has been my fave for the longest time and I usually go for either sure or Dove deodorants in general just prefer the scent of it. Would I repurchase it? YES I always try and get these when they are on sale as well because I use them all the time. 10. The body shop Tea Tree Toner- Since I have oily skin and prone to brake outs I tried all of the Tee Tree range form The body shop, using it all together dried but my skin but I did find my faves that I have stuck with now for ages and this toner is one of them. It takes out the last bit of dirt from my skin after I am finished cleansing it. The body shop website does not have prices and I cant remember them either but I think it was a bot over 10euro or around that price point, as well as they came out with 400ml bottle witch works out so much cheaper to buy than the 250ml. 11.Vichy Aqualia Thermal eye balm- LOVE IT, my main concern is that my under eye area can get dry and makeup will look cakey and really bad this just does the just it is really light weight and keeps everything soft and moisturized. If you are willing to invest and look after your skin you wount regret this eye cream. 12. L'Oreal Lumi Magique primer- This is great for dry skin as a primer or use it as highlighter, in my opinion this is expensive as a drugstore product. This costs €14.99 for 20ml, Mac travel size strobe cream costs €10 for 30ml. 13.Smashbox Halo Highlighting wand in Pearl. I had this for a long time and finally finished it, nothing special or amazing just normal liquid highlighter gave a nice glow, I could not find it on Arrnots or boots website for the price so I assume that they are not seling it anymore at least in Ireland.